Hyundai's little sedan gets a thorough makeover and a new diesel motor for more punch. 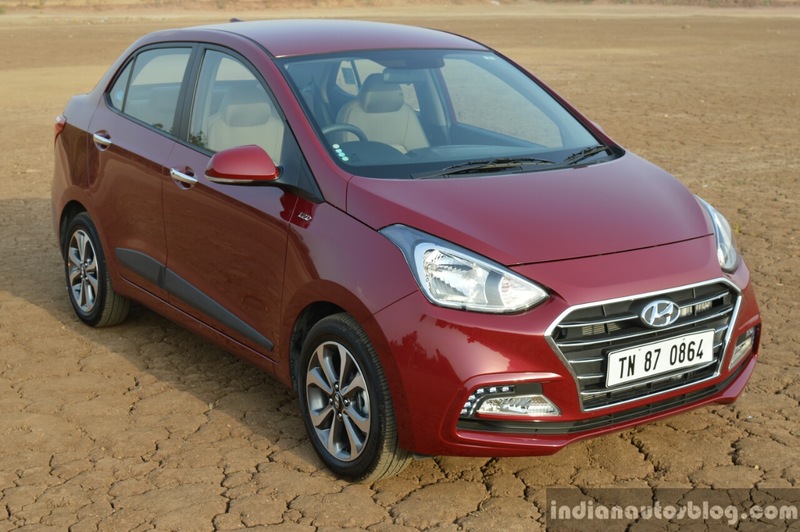 When the Grand i10 received a mid-cycle facelift back in February, it was inevitable that its 3-box sedan sibling - the Hyundai Xcent - would also embrace one. After all, with a new Maruti Dzire in the horizon and Tata launching the value-for-money Tigor, a facelift would help the Xcent stay relevant in the segment. 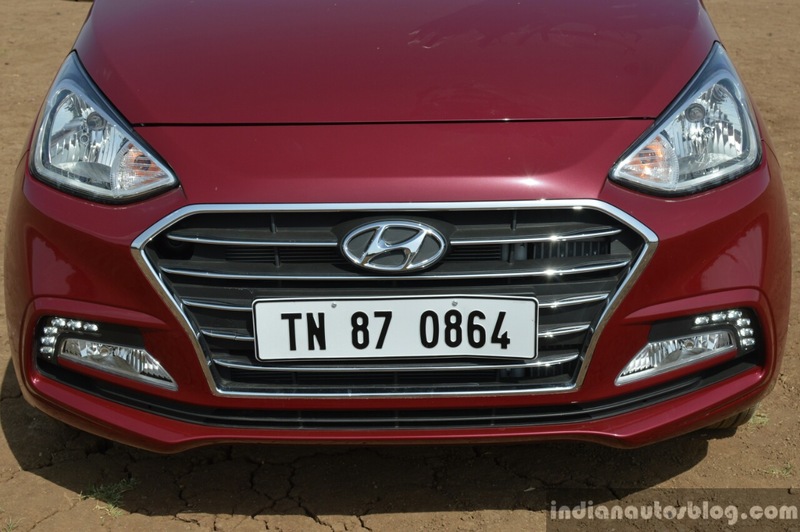 However, instead of a small nip and tuck, Hyundai has given the exterior a substantial facelift for an entirely new look, the interior gets a new touchscreen system, and the diesel variant packs a new 1.2L 3-cyl diesel motor for more punch. Does it make the new Xcent more appealing than before? Read our first drive review to find out. When I came across spy shots of the Xcent undisguised, attractive was the last word that came to my mind. However, those spy shots were low res images shot at a shabby stockyard, so I had to reserve my judgement until the Xcent arrived at my garage. So now that I have had for a few days, has it changed my opinion? Well, not quite. Rather than borrowing the Grand i10's sporty front fascia, the Xcent takes a more premium route that tries to emulate the look of its bigger sedan siblings. However, no matter how many days I spent staring at the front fascia, it just hasn't grown on me, particularly because of the hexagonal chrome grille and bumper design; the front fascia just looks a bit over-the-top and doesn't match with the Xcent's short snout. Also new are LED DRL strips available from the Xcent 'S' grade, which look a bit after-market. From the side, the Xcent is more or less similar to the outgoing car, even retaining the dual tone 15-inch alloy rims. The facelift becomes more significant once you step to the back, featuring larger wrap-around taillamps, a sculpted spoiler and new dual-tone bumper. You would think that the rear-end is narrower than before, but it is just merely the facelift imparting that impression. 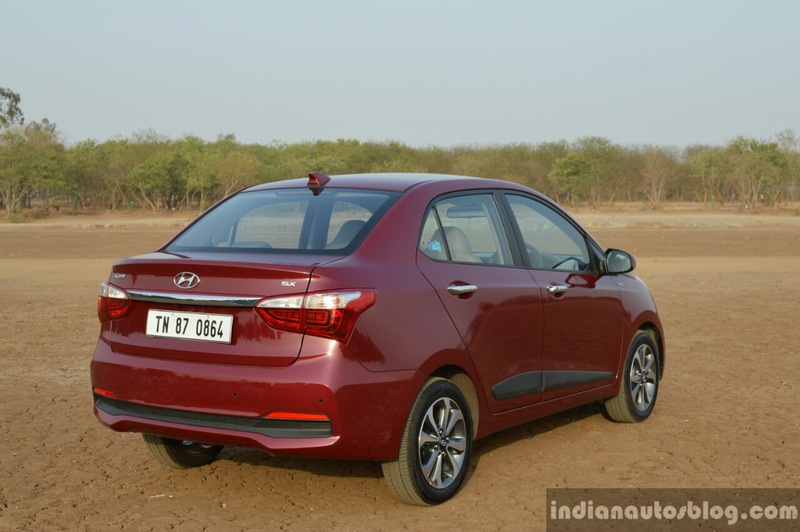 At least from the side and rear angles, Hyundai's new Xcent is one of the better looking sub-4m sedans on sale, although the design is still not as cohesive as the Tata Tigor or Ford Aspire. Okay, now that we have covered most of the negatives, let's delve into the positives, a massive one being the interior's quality of construction. 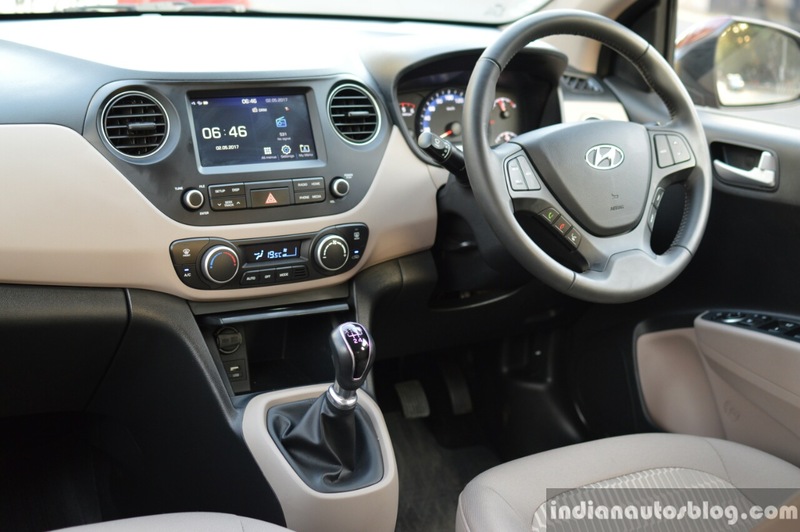 For an entry-level compact sedan, the Xcent's interior is well put together and can easily shame the interiors of some bigger, more expensive cars from other manufacturers. It is up there with the VW Ameo and would easily impress a customer looking for a premium experience from a sub-4m sedan. The only qualm I have is that the dashboard looks a bit too plain, despite the dual tone colour combination. Gloss black panels on the centre console, HVAC buttons and lid for the cubby hole beneath would spruce up the dashboard. At the back, there's just about enough space for tall adults, the narrow bench seat is comfortable and has a foldable armrest, should there be only two occupants at the back. And, of course, it has a dedicated HVAC vent that wasn't offered in such a segment of cars until the Xcent came along. The only significant change is the new 7.0-inch AV touchscreen system offered in SX and SX(O) grades. 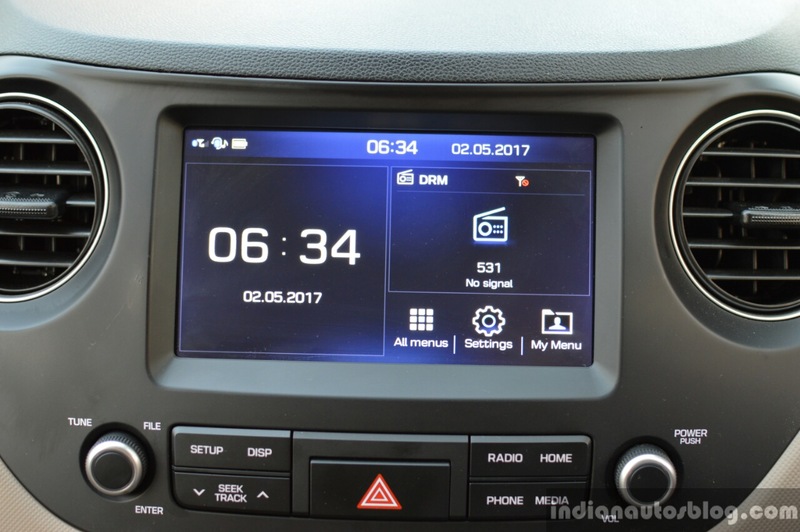 It is the same unit found in the 2017 Hyundai Grand i10 and is the best touchscreen infotainment system in the segment. For starters, it offers a segment-first Apple CarPlay and Android Auto with support for voice commands and multi-touch gestures. The system is quick to respond with smooth animations and has a capacitive touchscreen for feather light input. Like the previous model, it comes fitted with a rear-view camera, although this time you need not squint your eyes for a clearer view. Hyundai has ditched features like auto dimming mirror, 1 GB storage memory and Cluster Ioniser for the automatic climate control (SX(O) only) in the top-end models which, we reckon, is attributed to competitive pricing. Another noteworthy change is that ABS is not standard across the Xcent range anymore, but only fitted in SX and SX(O). Instead, Hyundai has equipped dual airbags and a fuel-saving Alternator Management System (AMS) right from the base variant. 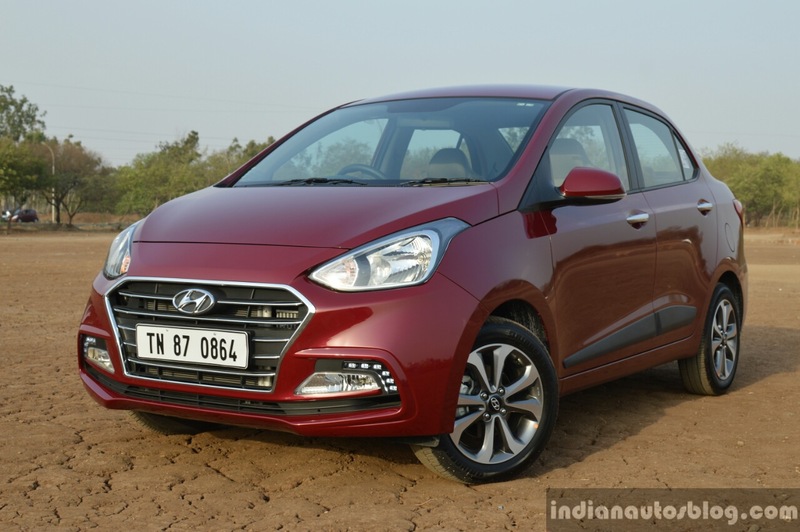 Like the Grand i10, Hyundai has also ditched the 1.1L CRDi 3-cyl diesel motor for a bigger 1.2L U2 CRDi 3-cyl motor that produces 75 PS at 4,000 rpm and 190 Nm of peak torque in the range of 1,750 to 2,250 rpm. While cars like the VW Ameo, Tata Zest, and Maruti Dzire offer automatic options for their respective diesel variant, the Xcent is only available with a 5-speed manual gearbox. One of the biggest criticisms of the previous Xcent was that it lacked the oomph and smoothness of a 4-cyl turbodiesel motor otherwise fitted in its rivals. 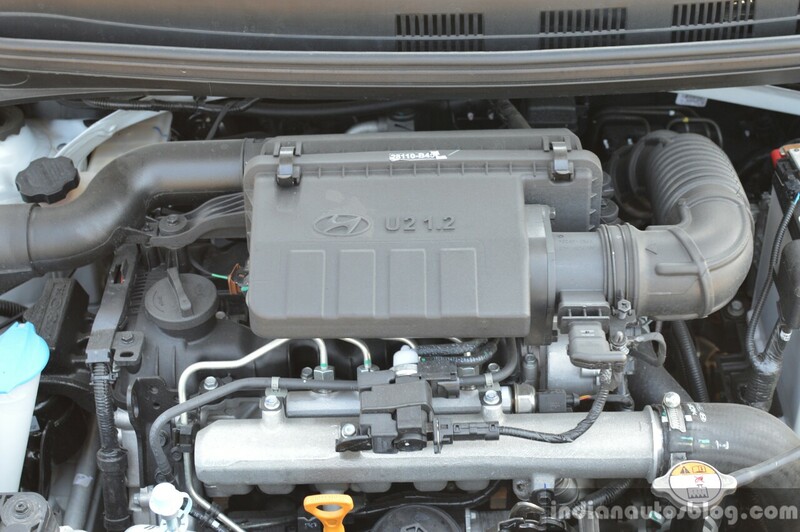 Introducing the 1.2L motor is Hyundai's response to the criticism, and it has worked wonders. The Xcent is now more spirited to drive and seems more refined than before. Its 3-cylinder characteristics are still discernible, but not too much of a bother after spending a good time behind the wheel. While the torque kicks in at an early point of the rpm range, power tapers off at around 3,500 rpm after which the engine is just screaming with no thrust. So you will have to work your way through the 5-speed gearbox to get a move on or make quick overtakes. Fortunately, the Xcent's 5-speed unit is a treat to work with, offering precise, smooth gear changes, while the clutch pedal is relatively light and easy to modulate. 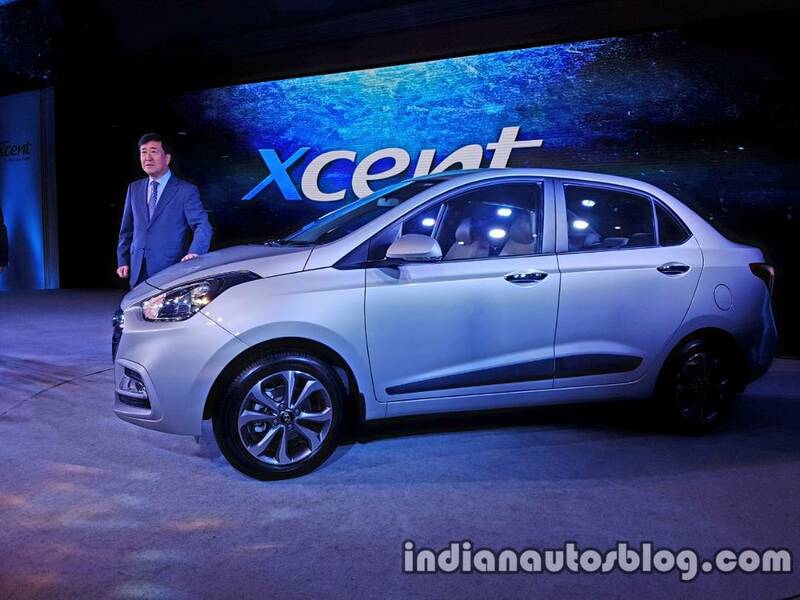 Hyundai claims that the new Xcent can average a fuel mileage of 25.4 km/l (ARAI certified), which may not be a class-leading figure but still respectable. 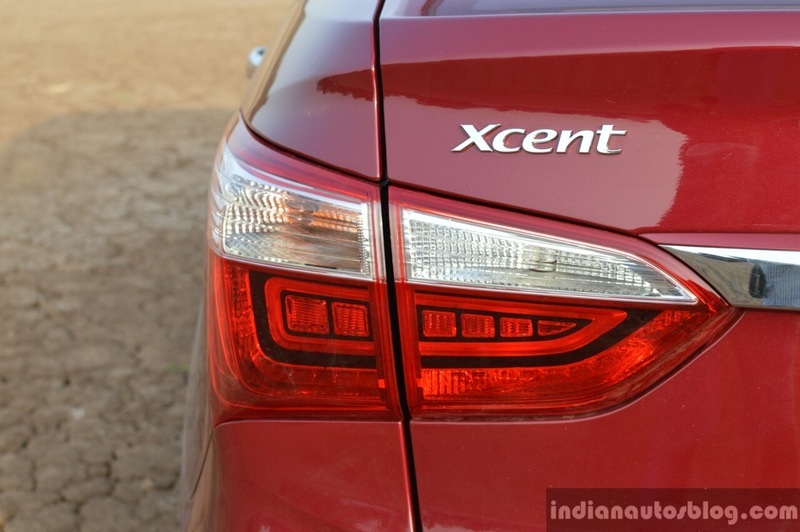 As I had expected, the new Xcent does not get a mileage or real-time fuel efficiency read out, so we could not find what its actual average was during our test run. The ride quality of the new Xcent is on the softer side of the scale with a plush pliancy to it, which is what I had exactly expected. It smothers most potholes and speed bumps with relative ease like a hot coal iron on wrinkled clothes. The steering wheel is, as typical of Hyundai, accurate, feather light in urban conditions and artificially weighs up as speeds increase. In this instance, it does not necessarily matter if the steering system is talkative or not. Owing to the popularity of compact SUVs in India, demand for compact sedans has witnessed a small decline, but that has not stopped manufacturers from giving up just yet. There is still a significant percentage of car buyers who would not mind putting their hard-earned money on a sub-4m sedan, as it is a more practical and more appealing body style than a hatchback. The previous Hyundai Xcent was not necessarily perfect from the start, given the diesel variant's lack of power and that the styling could've been more distinctive from the Grand i10. For the mid-cycle refresh, Hyundai has not only addressed both points but further refined the premium appeal by a notch. It is still not perfect, but it is too hard not to put the new Xcent on your shortlist if you are in the market for a sub-4m sedan.